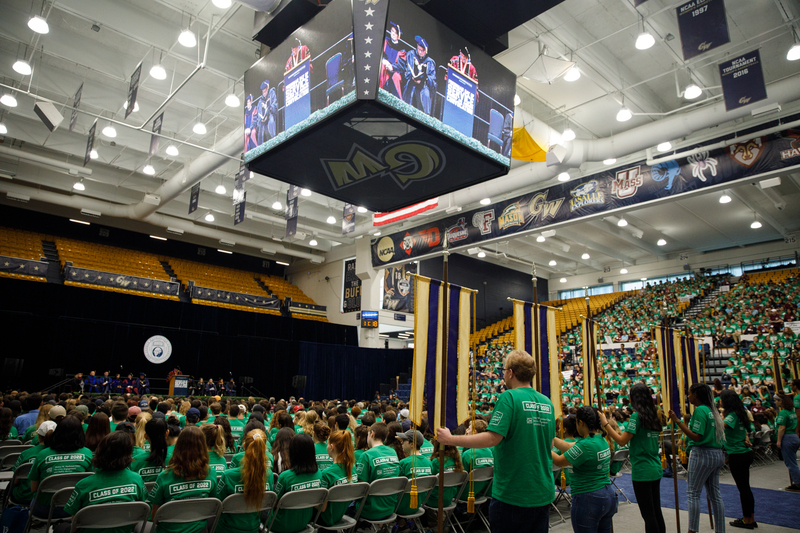 Thousands of first-year students gathered in the Charles E. Smith Center Saturday morning to formally mark the beginning of their time at the George Washington University, and they heard words of welcome, encouragement and caution from GW’s president and provost. 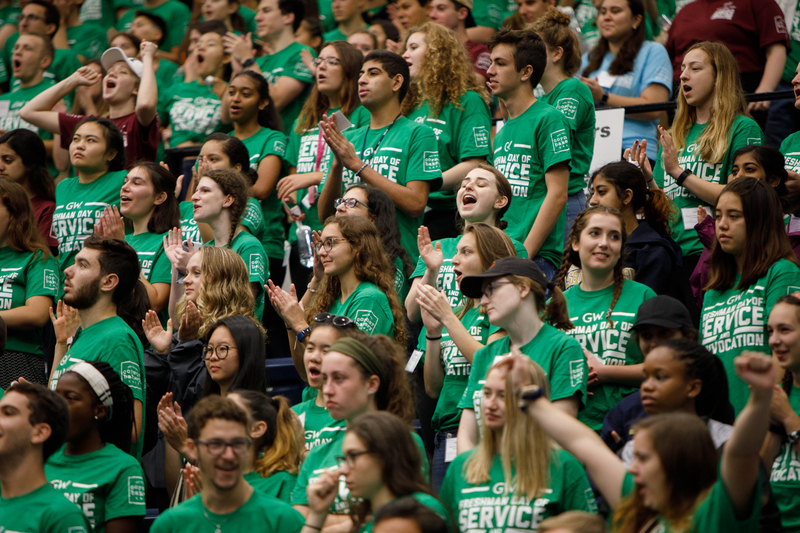 The class of 2022 filled the arena stands in their bright green T-shirts for the GW tradition. 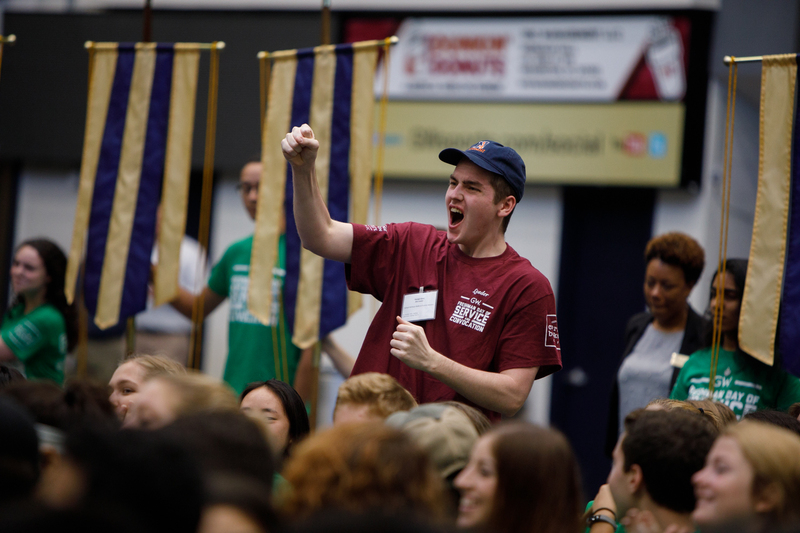 They had an opportunity to show pride for their individual schools and colleges with cheers after introductions from their respective deans, to learn the university’s Alma Mater and to join in on the GW Fight Song. 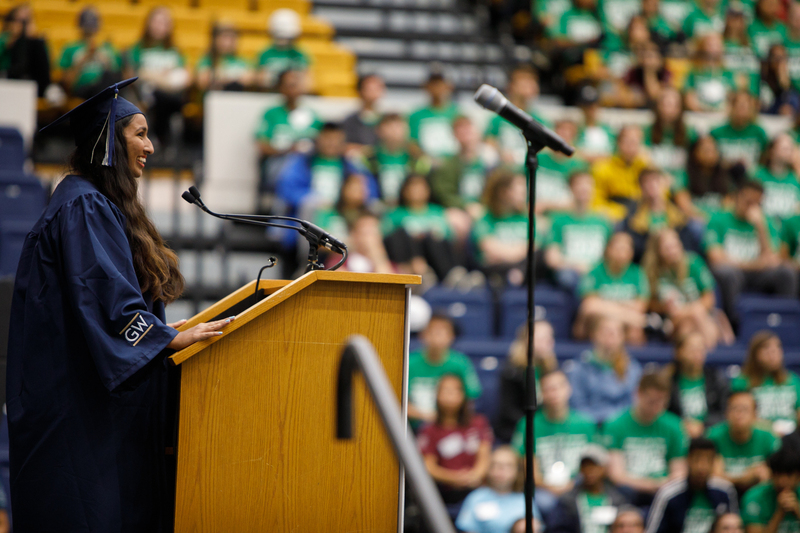 Convocation also marked the beginning of the Day of Service in which first-year students volunteer at more than 40 sites in the Washington, D.C., area. 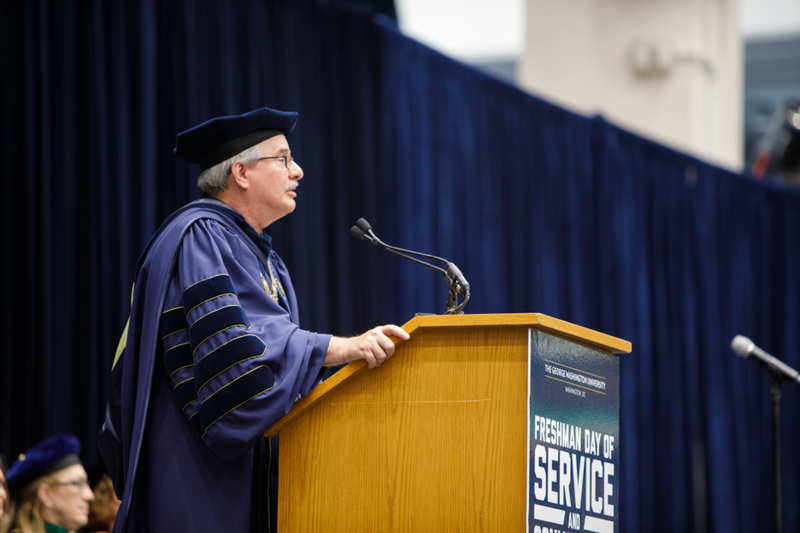 In his remarks, President Thomas LeBlanc focused on the importance of taking full advantage of what is offered at GW. 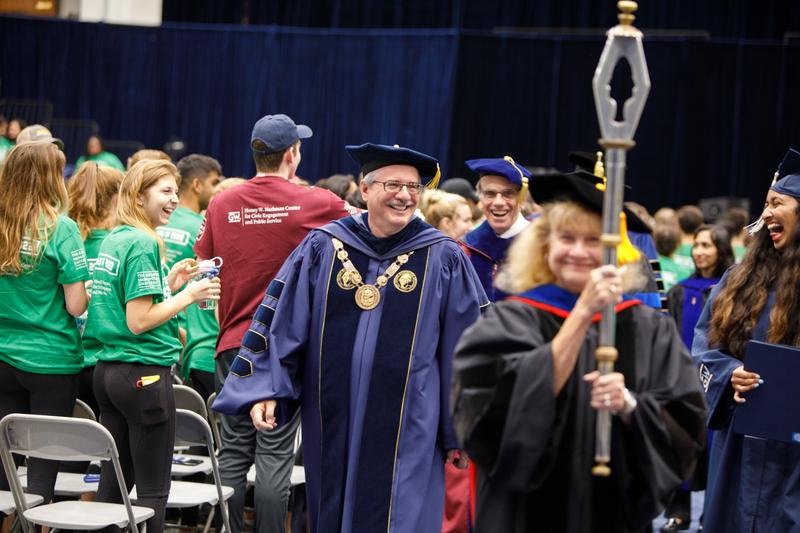 He said that in his first year as president at GW, he has seen students grow intellectually and socially while exploring new ideas and has seen lives transformed and potential realized. “If you express an opinion on social media, you abandon the protections and considerations that are given on this campus,” Dr. LeBlanc said. “Here, we expect you to experiment with the ideas of the world and sometimes fail spectacularly. We celebrate that and view it as an opportunity to learn and to grow. 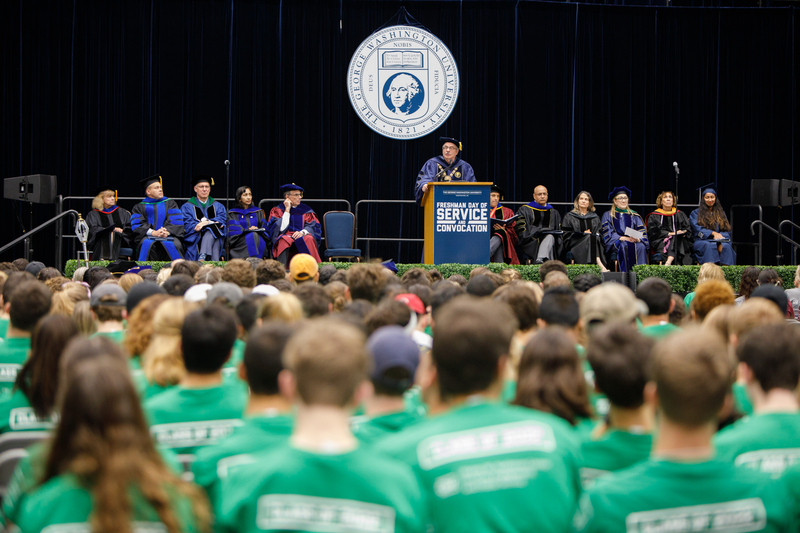 President LeBlanc encouraged students on their paths to self-discovery at GW during his Convocation remarks. Dr. LeBlanc also talked about concerns over first-year students seeking professional growth with off-campus internships at the expense of taking advantage of the opportunities for personal growth on campus. “There is great value in being on a campus in the nation’s capital, but internships are only one part of that value,” Dr. LeBlanc said. “In these first few months of your college experience, an internship can be a distraction from the important work of laying a foundation for success here at GW. “I urge you to use this first year carefully,” he added. “Take the time to learn how to succeed in college and begin to build knowledge in your chosen field. Make friends, spend time with faculty, go to the Smithsonian, there are a thousand things you can do in your first year at college that will build that foundation for your success in the future. 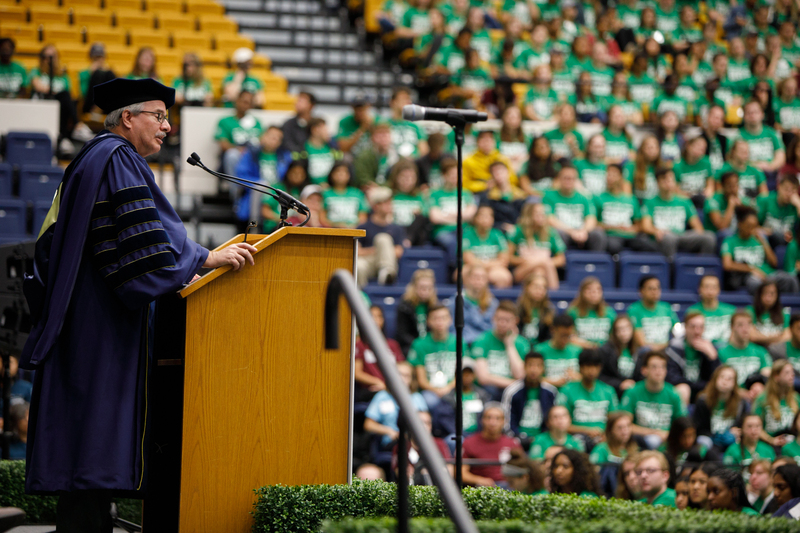 He ended his remarks by encouraging the first-year students to broaden their awareness of the world beyond their own experiences, because the next few years at GW will be the best opportunity they will have to do so. 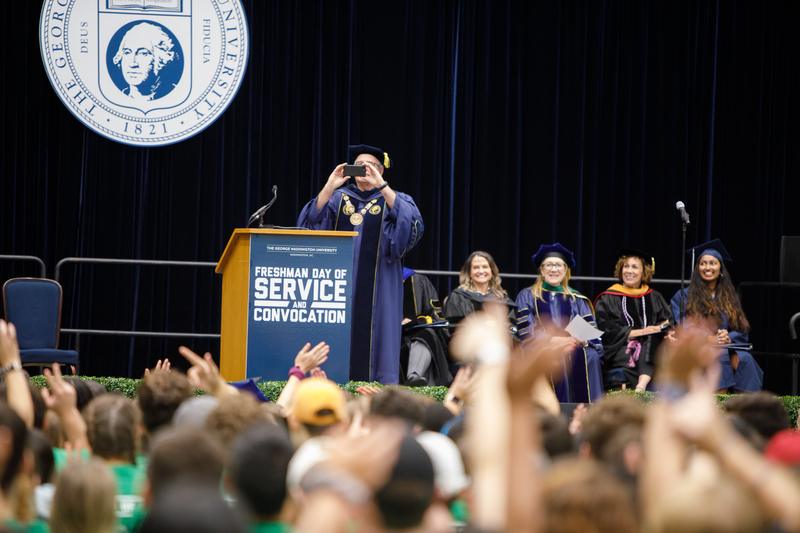 In earlier remarks to the class of 2022, Provost Forrest Maltzman said that Convocation is an official welcoming into the GW community. Responsibilities come with being part of the GW community, he noted, including ensuring that GW is an inclusive environment for everyone. He announced that first-year students would be required to participate in an online educational opportunity that is focused on diversity, equity and inclusion. Dr. Maltzman told students that they may learn new language and terms and may begin to ask themselves more questions while challenging themselves to grow. “If you are familiar with the content, we expect you to challenge yourself even more,” Dr. Maltzman said. “Model the behaviors, use the language, engage in self-reflection at a deeper level and move out of your comfort zone by interacting with people who grew up in different circumstances and are different from you. “Be part of GW’s journey towards a stronger community,” he said. He asked students to commit to making GW welcoming for all, keeping an open mind, fostering respectful dialogue and challenging harmful biases. He also encouraged them to get to know their classmates with their unique perspectives and experience from around the world and be kind to each other during this period in their lives where they are all growing at GW.